As you stop to admire the new leaves on a tree this spring, you may notice holes carved in trunks and branches. Who made these cavities, and why? 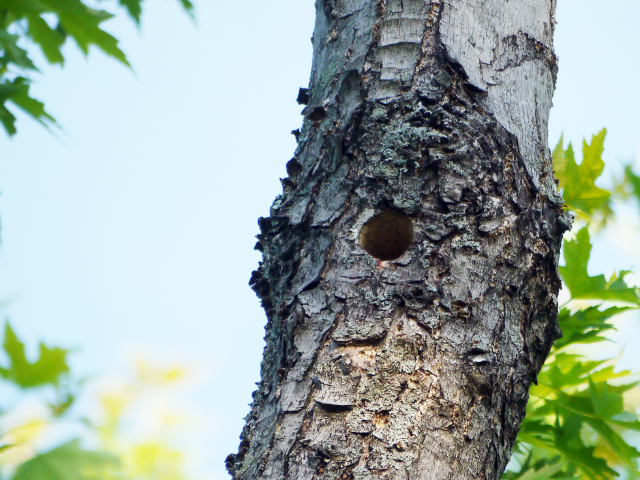 Smaller pits may be the work of insects, but most of the larger holes were created by woodpeckers, either for feeding or nesting. Here’s a quick guide to some of their handiwork. 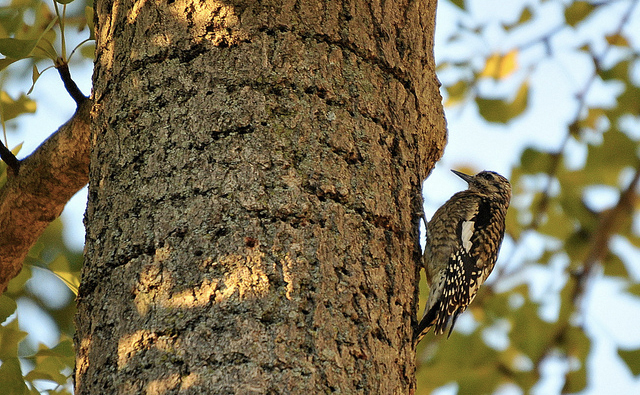 Many woodpeckers carve into trees to find food in the form of insects or sap. Here are some of the species you might see. Master excavators, these huge birds have chisel-shaped beaks and even feathery tufts over their nostrils to protect them from wood shavings. To get at carpenter ants—their preferred food—they dig deep, rectangular-shaped holes often a foot or more in height. Look for piles of wood chips on the ground below, like the shavings on the floor under a carpenter’s workspace. Smaller birds typically make smaller holes. Those of hairy woodpeckers are usually no more than ½” wide. These birds tear off bark and drill in search of insects such as beetle larvae, making a wavy pattern as they weave back and forth on a trunk. 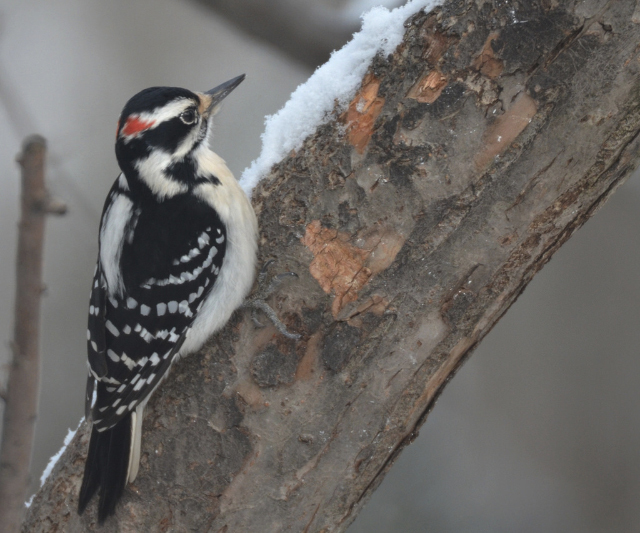 Downy woodpeckers prefer to probe thinner branches and the stems of reeds. 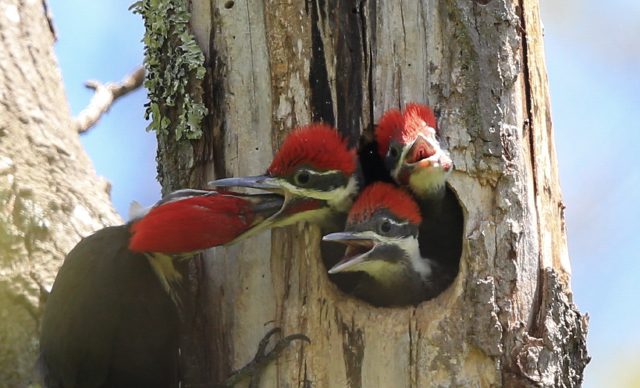 Red-bellied woodpeckers also peck into trees, and are more likely than some other species to store seeds in tree crevices. These birds make unmistakable horizontal rows of small holes, often in sugary trees such as maple and birch. Sap collects in these wells, and, true to their name, sapsuckers slurp it up with their brush-like tongues. They don’t just drink tree sap, though. Insects that are attracted to the sugary liquid become a protein-rich meal for yellow-bellied sapsuckers. Woodpeckers also dig deeper cavities for roosting (or resting) and nesting. In order to keep out big predators, they carve entrances that are just large enough for them to come and go. The diameter of an entrance can help you figure out which bird is using it. A few bird species, such as black-capped chickadees and red-breasted nuthatches, also make shelters in trees. However, they only use dead wood that is relatively soft and easy to carve. These excavations aren’t just useful to the woodpeckers. 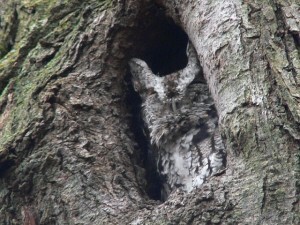 Birds such as eastern screech owls, wrens, and bluebirds need pre-existing cavities for their nests, and they often use woodpecker holes. Flying squirrels and mice shelter in them, too. The sap-filled wells of sapsuckers are an important food source for mammals, insects, and birds. In particular, ruby-throated hummingbirds rely on them in the early spring, before the flowers have bloomed. Keep an eye out for holes in trees. Next time you spot one, you may have found a bedroom, a cafeteria, or a nursery! This entry was posted in Nature Notes on May 20, 2015 by Rosemary. I am having the same issue with 3-4 inch holes near the base of the tree. Who would it be and how can I fix it? Where do I send my pics to? trying to find out what may be “carving ” openings in side of a tree…several “holes” one as big as a 3 inch oval. the odd thing about this is that th openings are all low on the tree – no higher than 4 feet above the ground. I thought the woodpeckers would do this much higher in a tree……any thoughts if it may be a different creature? 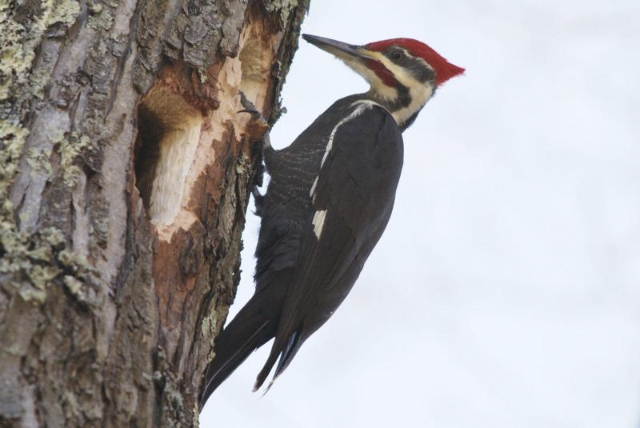 Oval holes sound like Pileated Woodpecker. If you can send photos we can tell for sure. You can email wildlifeinfo at massaudubon.org. I found holes in a tree on my property. I have a feeling my neighbor did it to kill the tree. How can I find out what or who did the holes?